Some of my fondest childhood memories seem to revolve around music. When I was six I saw Beauty and the Beast in theaters, and I remember walking out enchanted by the music, the story, and that amazing library that the Beast gave Belle. When I was in middle school my mom would try to wake us up every morning by singing songs from her favorite musical (it never worked). And when I was a teenager I saw my cousin perform the lead in My Fair Lady, and right after that I decided I wanted to join the choir and start voice lessons. Music has been, and still is such a huge part of my life. This year I really wanted to do a different theme for our Christmas tree. Chris and I have had the same tree since our first Christmas together in 2009, and while I love the blue and white theme I really just wanted something different. In Northern Virginia there is this amazing Christmas store and for my birthday my mom came to visit and we went shopping there. My mom always has magazine-worthy Christmas trees in her home and I wanted her help on how to make mine the same. We walked by four or five trees until we came to the one. 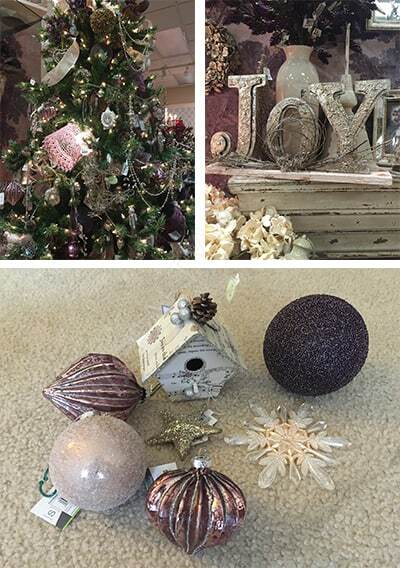 It was a very feminine looking tree, and if I lived by myself I would not have hesitated at all in buying the ornaments for it, but since I live with Chris I wanted to text him and get his opinion before I bought anything. I’m very lucky that my husband is a laid back and go with the flow type of person, because he was all for a purple tree if that’s what I really wanted. And it was! I’m not going to lie, the bulbs for this particular tree were pretty expensive. I bought a good amount but because we have such a large tree it needed more bulbs to look full. Because I really loved the musical bird house I took that as my inspiration and decided to put more sheet music in my tree! Empty glass bulbs, available at any craft store! Start by cutting your sheet music into strips. I did 1/4 to 1/2 an inch depending on how I was feeling. I personally ended up liking the strips a little bit bigger. Use the scissors to curl the strips of sheet music. Put the strips inside the bulbs. With the larger strips, you’ll have to uncurl them to get them inside the bulbs. Don’t worry, they’ll curl right up again once they’re inside! If you want to tie a ribbon to the top of the bulb, now is the time to do it! Otherwise, you’re done! I personally made about eight of these and placed them throughout the tree. To make them, I just put on a Netflix movie and crafted during it. The longest part of the project was definitely cutting the sheet music into strips, after that the rest was a breeze! I really love how everything is coming together this year. This tree feels very personal to me and that is one of my favorite things about it. Our home is constantly filled with music, whether Chris and I are making up funny songs or I’m belting out a Broadway tune, and so this tree feels perfect in our home. 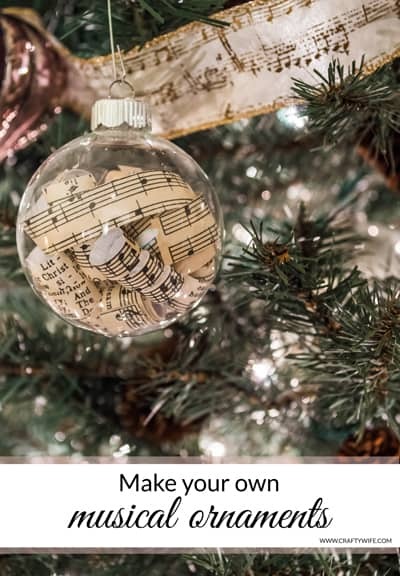 Do you craft your own Christmas decorations or would you rather buy them already made from the store? This is such a fun idea! 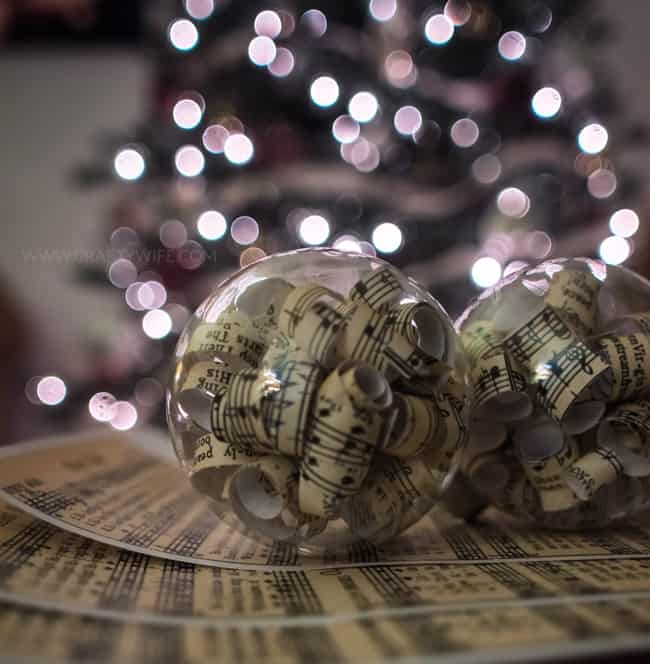 I have several family members who are really into music, and these would be such simple yet thoughtful gifts! Thank you, Megan! This would definitely be a fun gift idea! These are so cute! I love them! I think we’ll talk about doing this for next year since my kids are more involved with music now. Thank you, Christine! This would be a great craft for kids!